The Daewoo QT1 is a modern quirky microwave oven finished in white - offering a small 14 litre capacity and 600 watts of power. 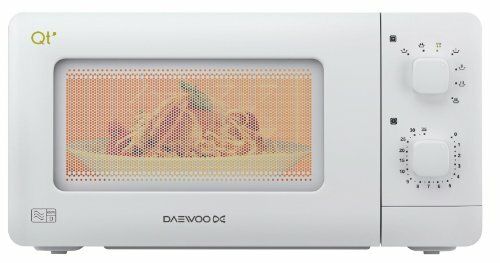 The QT series from Daewoo looks pretty different from the rest of the microwaves currently available on the market - they're funky, quirky and fun, which is a refreshing change from the predominately boring looking microwaves that the majority of manufacturers produce. All of the Daewoo QT series feature a relatively small capacity - at 14 litres they won't be hugely practical at cooking large dishes - however they are light, stylish, and will fit into tiny spaces. If space is of a premium in your kitchen then you well be interested in the Daewoo QT1. They're ideal for work places, students, or just as a simple and fun method of heating and cooking food. In terms of budget, they are at the lower end of the solo microwave price range - however due to their size and the fact that the QT1 is manufactured by Daewoo, we can't foresee any issues regarding reliability. Despite the small size, the Daewoo QT1 will accommodate most large dinner plates - so no issues if you're looking to heat up foods. The QT1 features a 600w power output, complete with 7 different power levels. Inside you'll find a 255mm glass turntable, and the exterior features a white and lime green colour scheme. Despite the relatively low power output, the Daewoo QT1 still heats up fast - this could be due to the decreased size when compared to the majority of solo microwaves, which are typically 6 litres more spacious. The fonts, buttons and graphics used look pretty modern - and as such it may not fit into a traditional kitchen - however for those who fancy something a little quirky, then this is an ideal microwave. Students in particular will love this microwave - it's beautifully compact, works well, looks pretty stylish and during our testing period proved to be reliable. In terms of size the Daewoo QT1 measures 27.5cm by 16.7cm by 30.0cm externally, and features a 255mm turntable, with internal dimensions of 27.5cm by 16.7cm by 30.0cm and overall weight of 9.2kg. With a convertor you may also be able to use this microwave in a caravan - it's small dimensions will make it suitable for this. Build quality is pretty good too - especially considering the cheap price tag of under £60. Overall we found it pretty easy to use, and it cooked well. It may be unsuitable for large families due to it's size, but for what it does, it does well. It's perfect for use in kitchens where space is of a premium, and offers an effective method of heating and cooking foods. Granted, it's not going to be suitable for use in a commercial environment, and as a solo microwave it obviously doesn't feature an oven or grill, but for the low price tag it offers exceptional value and performance. Our testers were very impressed with the Daewoo QT1 overall, and we wouldn't hesitate to recommend this microwave to our readers. Highly recommended. The QT1 from Daewoo is an ideal starter microwave for new home owners, students, or simply used as a quirky microwave in the work place. It seems to be very well built, and pretty cheap too. Our testers really liked this model - one of whom has since bought a QT1 for their home - they're simple to operate, work well and are reliable. Recommended! Also available in the QT range are the Daewoo QT2 and Daewoo QT3. do you hold Daewoo QT1 Microwave in stock please?